I was in London yesterday talking to a bunch of primary schoolkids as part of the Crystal Palace Children's Book Festival, and I have to say it was pretty much just the best time. 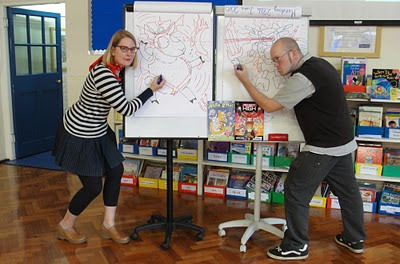 My esteemed colleague Sarah McIntyre (whose fabulous book Vern & Lettuce is officially on sale TODAY, go get one) and I were doing a joint session where we each talked a bit about our comics and how we make them, and then took some questions from the crowd. That all went pretty well, and it was gratifying to see so many hands shooting up to ask questions, but then we got onto the 'drawing bit', and the whole thing just went nuts. (That is my 'Game Face'). At the end Sarah got the kids to vote for who would win the battle, and it was a pretty resounding victory for the robot. I responded to this victory in a way that I can only assume was brought on by light-headedness from not having eaten anything that day, in that I jumped up and down a lot and ran around the room high-fiving the entire front rows, apparently under the mistaken belief that I was Kanye West. I went into one of the classrooms after to help the kids draw their monsters for the festival, and the nuttiness continued. Half the room shouted "NEILL!!!!" and jumped up and ran over to mob me and get me to sign anything and everything they could get hold of. (I do hope this doesn't sound braggy. I'm just trying to convey the sheer hilarious surrealness of the experience. It was the closest I expect to ever experience to being The Beatles. And Norm from Cheers, all rolled into one). 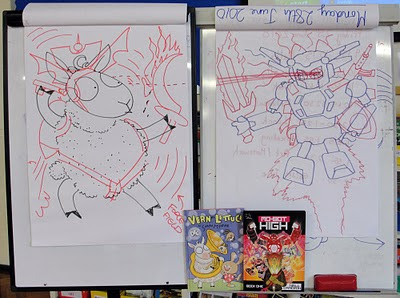 Anyway, it was so much fun that I'm hoping to do a lot more of these school and library type events in the future, as we get nearer to Mo-Bot High coming out. 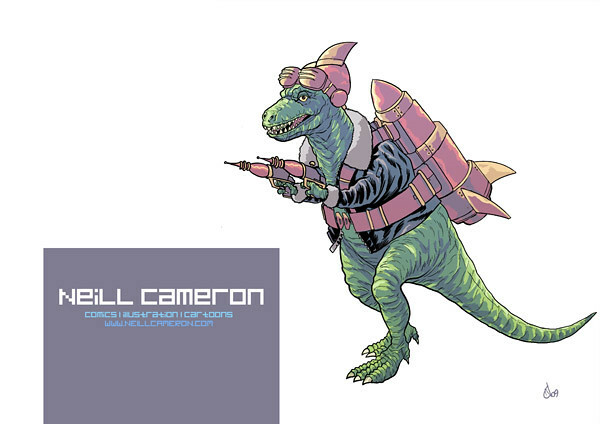 There'll be an events page and full booking information going up on my website soon, but if anyone wants to get in touch in the meantime to arrange anything, please holla at me at neill (at) neillcameron.com. Gosh, what a long blog post. And I haven't even managed to mention that I got an all-too-rare opportunity to hang out with the lovely Garen Ewing, and see a copy of the Rainbow Orchid in Dutch! And most uitstekende it looked, too. 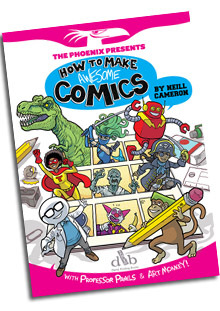 Am making a banner for various upcoming comics types events I shall be at! 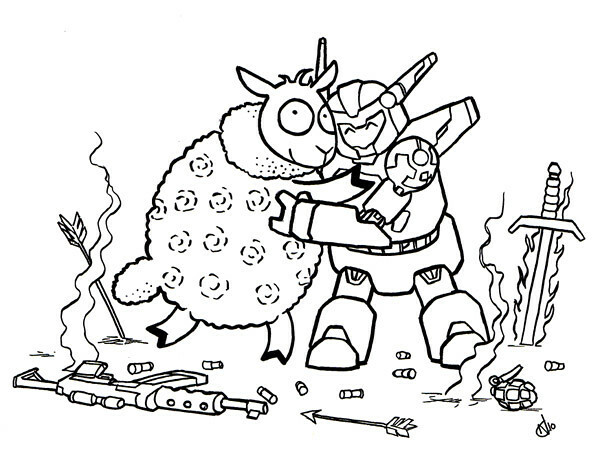 Might tweak this a bit further, but you get the basic idea. I wanted it to look quite colourful, you see. Will put up a proper events page soon, but for now I'm looking at being at MCM Expo and the Birmingham BICS show in October, Leeds Thought Bubble in November, and various other schools events and literary festivals in between! 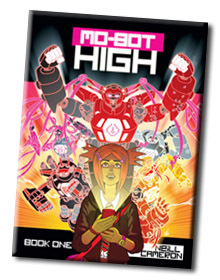 And of course, the Mo-Bot High BOOK LAUNCH PARTY! More details coming soon, promise. To celebrate the release of Robin & Lorenzo Etherington's fantastic new book Monkey Nuts from the DFC Library, I drew a bit of fan art! And a lot of fun it was, too. 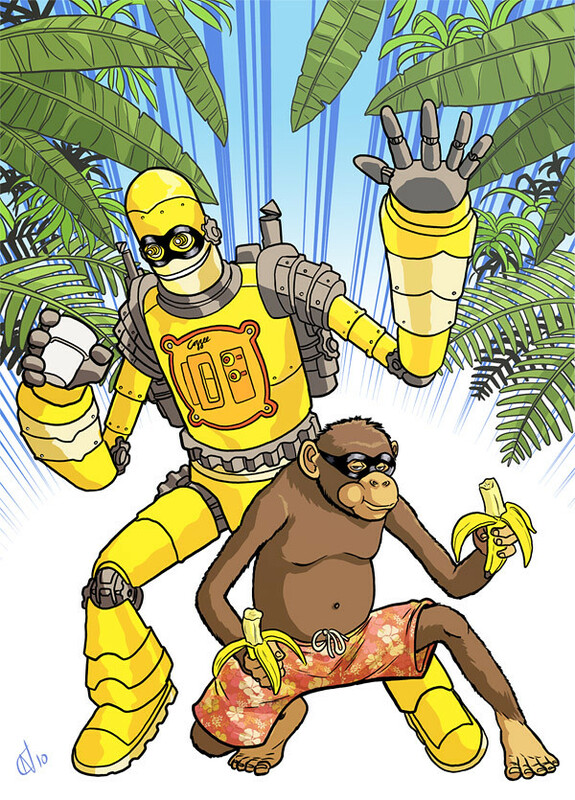 Monkeys and robots! What's not to love? I received my copy of Monkey Nuts from Amazon the other day, and a terrific bundle of joy through the letterbox it was, too. It's a really fun, funny tale, packed full of monsters, pirate ships and general mayhem, and Lorenzo's artwork is just... I mean, I really have no words to describe it. I'm a huge fan of the guy's work - pretty much every single page in this book just makes me drop my jaw and gasp in amazement. I think the best way of summing up this book is that it's pretty much exactly what I would have wanted in our school library when I was a kid. Although I would have totally hogged it week after week. 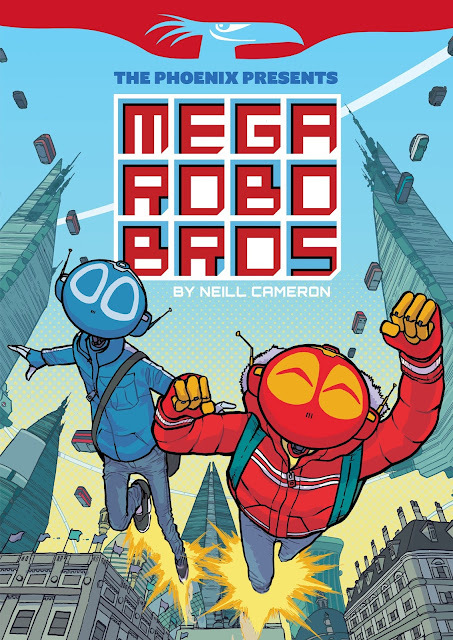 Anyway, all this reminds me that it's now only a month and a bit until Mo-Bot High comes out, too! And I have a whole lot of work to do before then... more soon! 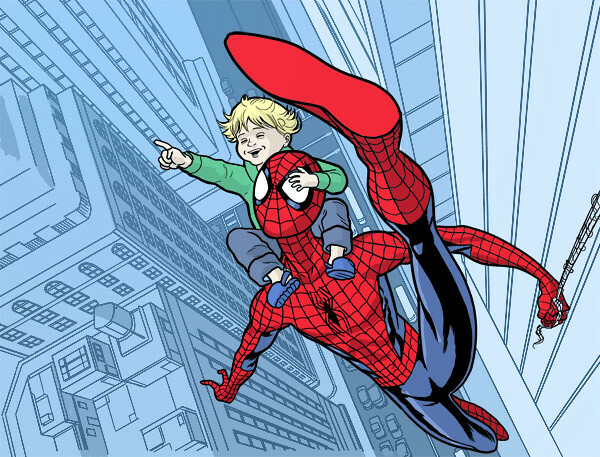 My son Logan is 3 today, and for a special birthday treat Spider-Man took him for a swing around town on his shoulders. 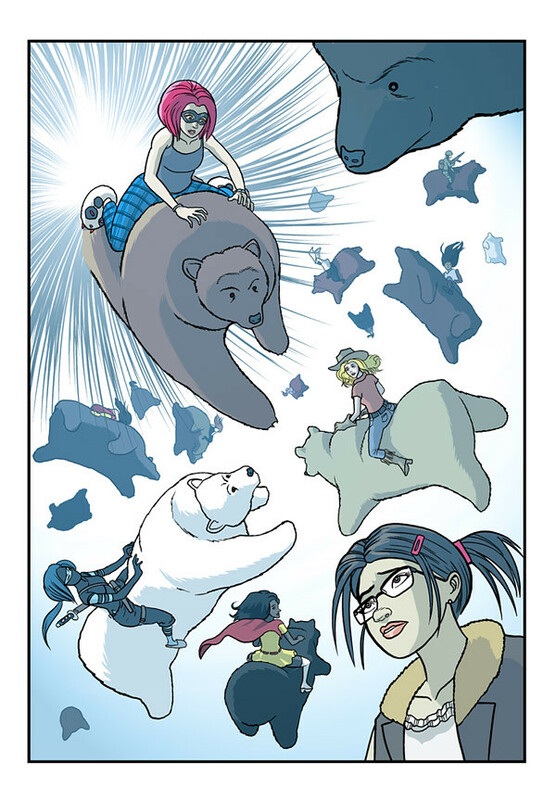 That's today's panel of Emergent Comics - today's script courtesy of xiombarg on twitter! Sorry this is a bit late - clearly this is going to have to be a 'when I have time' project, rather than an 'every day' one. Neill got bills to pay! Anyway, I'll try and keep it as regular as I can, so - to join in, just write your script for the next panel in the comments here, or tweet it using the hashtag #emergentcomics. You can read the full story so far here. But what happens next? What? WHAT?